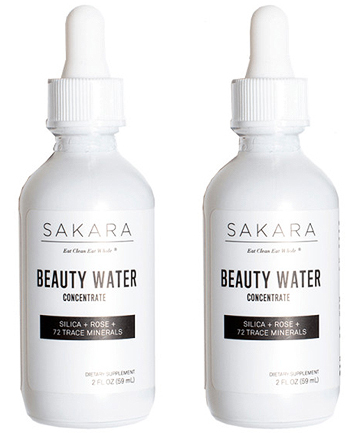 Sakara Beauty Water Concentrate has been the recipient of much buzz over the last couple years. It's a concentrated solution (which means you just add a few droppers-full to your water) that's formulated with silica, rose, and 72 trace minerals. Silica doubles down on cellular hydration, the rose calms and reduces inflammation, and the minerals nourish. The taste is slightly rosy — not overpoweringly so — which makes you feel pretty bougie. Also, note that the kit comes with two 2 oz. bottles that each have 10 servings, so the cost is technically $2 per serving.